Smoke & Musk is one of Earl of East signature scents and one of your all time favourites. It’s a bespoke blend of green balsam fir, alongside wood smoke and deep, musky patchouli inspired by Big Bear, CA and the great outdoors. This blend creates a warm & cosy atmosphere that will give you a sense of being in a cabin in the woods. Its dark and smoky, but woody-sweet profile makes it hugely popular amongst both men and women alike. 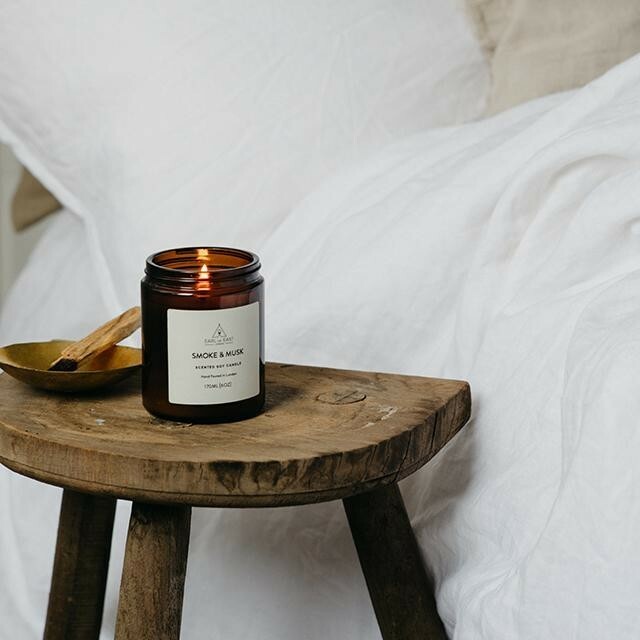 Hand poured in Earl of East Lo0ndon studio, this soy-wax candle will burn for 40 hours. All Earl of East scents are created using bespoke blends of the finest botanical fragrances and essential oils. They are made out of non-GMO eco wax and self-trimming cotton wicks, ensuring a clean burn and an excellent scent throw. Poured into beautiful dark amber apothecary jars, the candles emit a warming glow and work well in everyone’s interior.